Julie's post a few days ago about her children growing up (and away) got me thinking about my own attachment to the past. I wanted to email Julie with some words of wisdom. But, I had none for her. I kind of know what she's feeling (even though I'm not there yet). Kayla and Shayna are growing up so fast, way too fast. I often miss the days when I had to help them get dressed, feed them, cut up their food, etc. Quickly passing are the days when they would pile into bed with us every morning. First Kayla stopped, then Shayna. Shayna often by-passes our bed to go into Kayla's room and they lay their reading, talking or listening to their iPods. I was talking to a friend about heaven a couple of weeks ago and we were discussing whether we'd really see our loved ones there again. The thought of not seeing the girls into eternity is so depressing to me. But, he has grown children and reminded me that even now, each day, a little passing is taking place. I already miss the children I had a few short years ago. Those days are gone never to return. So, even in the here-and-now, I don't have the children I once had. I sometimes miss my youth. I miss my hair. I miss the time I used to have to work out and keep my body in decent shape. I miss the old me. The me today is not the me of yesterday and the me of tomorrow won't be the me of today. One thing studying Buddhism does is make me face this fact. All is impermanence. Nothing lasts forever. Each moment is unique, dependent on the last and fleeting. When I first started studying this concept, I found it quite depressing, until I considered the alternative. Clinging to impermanent things causes suffering. Learning to let go allows us to be happy in the only moment we really have- NOW. There is no past, it's only memories. There is no future, it's only thoughts of what might be. There is only an eternal now. What I have found is that if I can embrace the reality of impermanence it's really not depressing. Quite the opposite. Each moment becomes even more precious because of its uniqueness. Each moment is to be experienced to the full, cherished and savored. Many years ago a line from Carly Simon's "Anticipation" really jumped out at me. It's been one of my mantras ever since (I have many). That line is "These are the good old days." What that line says to me is that we are so quick to romanticize the past. "Oh, how great things were when...." One day I'll look back on this old guy of 46 and think of how great things were back in the youthful days of my mid-40s. So, what I try to do is to be nostalgic about these days while I'm in these days. That's the secret. Just as quickly as it's easy to think about how great the past was, it's easy to escape to the future, to think how great things will be when... When I make that first million, when I don't have to work so hard, when I'm not so busy, when I can move to somewhere warm. That trap is just as enticing as the one that draws me back to the past. 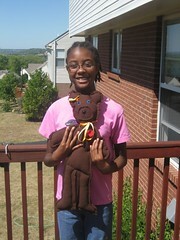 Today, Kayla is just about off of the growth chart we bought for her. 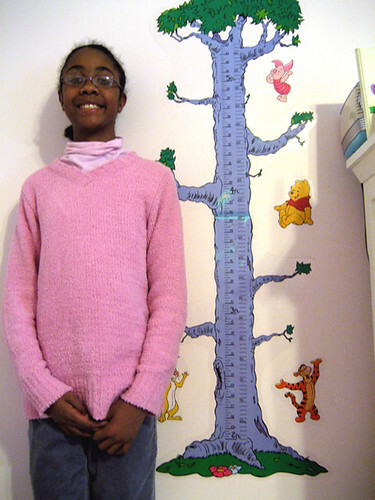 That's today's picture of the day, Kayla standing next to the little Winnie the Pooh chart as she quickly blossoms into a young woman. As I write this, the girls are off in Kayla's room working on an art project they designed themselves. One day, much too soon, they'll be somewhere else and Tywana and I will be here alone. But, I'll get to enjoy seeing them go off and live their own lives, have their own children and I'll be able to get that two-seater I've been wanting ever since I traded in my MR2 so many years ago. And maybe I'll be able to move to a little condo on a golf course and spend time alone with Tywana again. But for now, it's time to go grab them and enjoy the evening.